Representation of Latinx creators and characters in comic books improves each year. However, it can still be difficult to track them down. That’s why advocates like Professor Frederick Luis Aldama are so vital to our community. He has written a number of books about Latinx in comics as well as teaching on the subject at Ohio State University. 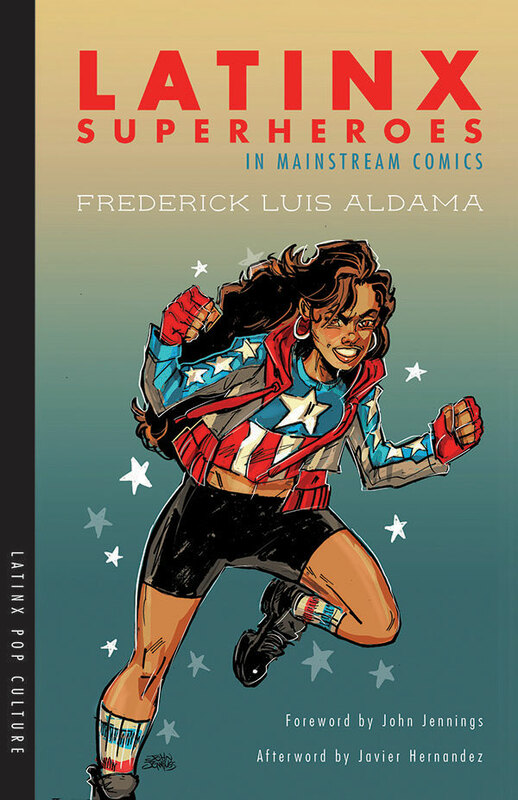 His most recent book Latinx Superheroes in Mainstream Comics! was very deservedly awarded the Eisner Award at SDCC this past weekend. His book not only catalogs all the Latinx characters since the Golden Age, but also examines some of the reasons behind the lack of accurate representation of both our appearance and culture. Professor Aldama took the time to discuss with me his award, the book, and some thoughts on the current state of Latinx in comics. Chris Hernandez: First of all, congratulations on your Eisner Award for Latinx Superheroes in Mainstream Comics! What was your reaction when you found out you had won? 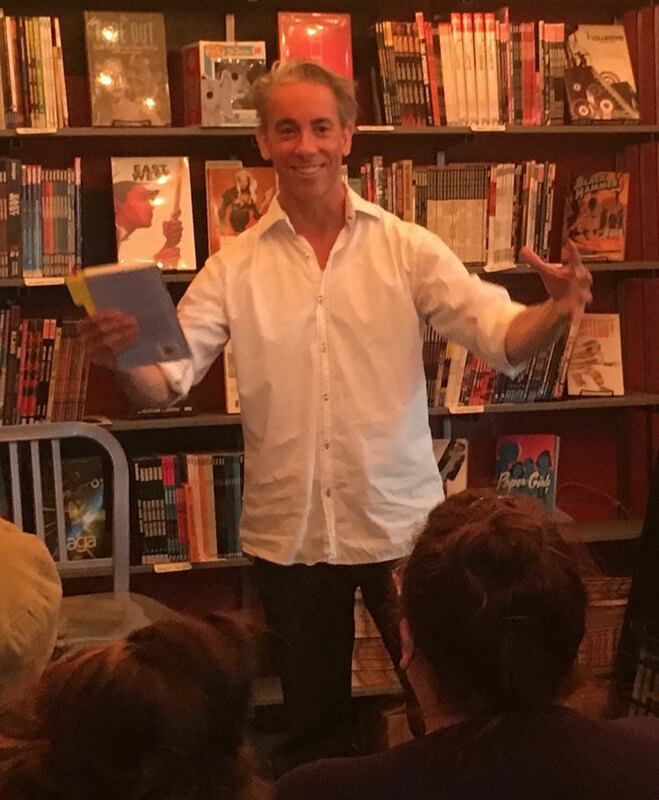 Frederick Luis Aldama: Chris, when they read out the nominated scholars and their respective books, my ears went into silence mode, my eyes turned downward, and my brain found a cushion to ready for disappointment. Then they announced it. Disbelief. Elation. Confusion. I really mean this. I wasn’t prepared at all for it. I knew my competition, including 4-time Eisner nominee and brilliant colleague at OSU, Jared Gardner, so I went to the ceremony to celebrate the triumphs of others, including friend, co-creator, and co-founder of SÕLCON: Brown & Black Comics Expo, John Jennings who picked up an Eisner with his copilot, Damian Duffy for Kindred. To attend the Eisner Awards Ceremony, I walked off the convention floor in my jeans, T-shirt–and with absolutely nothing prepared for an acceptance. Everyone else was dressed to the nines and had eloquent speeches tucked in their back pockets. I dedicated the award to all the comics creators (in the room and beyond) who get it right, to my students who carry the comics scholarly torch forward, and to my mamá who died young of cancer from all those pesticides they drop in strawberry fields across California. I had to catch the last plane out that night so unfortunately, I couldn’t stay for the after party—when the real fun was to be had. And, I asked if they could send me the Eisner Award trophy. I didn’t want problems with TSA at the airport. Four days later and my head’s still spinning! CH: How long did it take for you to compile the information about all the comic book characters for the book? FLA: You know how it is, Chris, we read comics — and since we were crumbsnatchers, and certain characters pop, staying with us forever: Hector Ayala as White Tiger, Bobby da Costa as Sunspot, Maya Lopez as Echo, for instance. I knew there were these and other Latinx superheroes in DC/Marvel comic book universes, but they largely go unnoticed. You don’t see them mentioned in the big DC/Marvel Encyclopedias and documentaries on superheroes never mention them; they are largely erased, too, in the superhero blockbusters we see today. So, I went back to the archive. It took two years of systematic digging, reading, re-reading, and analyzing before I came up with the material to tell this untold story. And, I wanted to be sure to include analysis and discussion of the importance of the visuals—what I call the geometrizing of the story. That is, it’s not only about getting the representations right—Vibe’s “dontchus” accented and truncated Englishims along with his exaggerated corporality are an example of how wrong it can go—but also how one needs to get the visuals right. By this I don’t only mean in the color palette used and the facial bone structures drawn (mestizo and not Caucasian, for instance) but in how a given set of visual creators create Latinx characters and stories that pop with energy. CH: What has been your own experience with comic books? FLA: My Guatemalan/Irish mamá crossed the US/Mexico border with us when we were escuincles. Our maternal tongue was Spanish. It was those spinner racks filled with comics at the corner that became my means for learning English. The visuals allowed me to understand the words. And, the stories opened my imagination to all sorts of different superheroic ways I could exist in the world. It didn’t matter that they weren’t brown. They could hurl fireballs, fly, shape-shift. . .This was especially important for a kid raised by a single mamá struggling to pay bills and put food on the table. CH: What is your opinion on the state of Latinx comic books/characters today? FLA: I’m a skeptical optimist. Blatinx artist extraordinaire, Felipe Smith, and Tradd Moore’s All-New Ghost Rider (2014- ) killed it — both in terms of Latinx representation and the geometrizing of the story. And, Robby Reyes as Ghost Rider made season 4 of Agents of S.H.I.E.L.D. Then season 5 comes along and he’s nowhere to be found. Gosh, if we go back through the history of Latinxs in in-print comics — and especially the move from in-print to film and TV — we see this pattern of disappearing dynamic Latinx superheroes and supervillains over and over again. It just happened with Gabby Rivera’s awesome queer Latinx superhero, America Chavez. I mean how much better can it get when you have a Latinx superhero who punches through world borders and vanquishes foes with her superhero luchador abuelitas? America had a huge following. Yet, Marvel dumped her. We see this pattern of willful erasure happening especially in the move from in-print comics to film and TV. I talk all about this in my book, but take Chris Nolan’s Dark Knight Rises as an example of a willful flub. Bane’s one of the great Latinx superheroes yet Nolan and his team cast Tom Hardy. Really? It’s why the creations among our Latinxgrapheurs is so important. Those like Jason “Gonzo” Gonzalzes (La Mano del Destino), Oscar Garza & Rolando Esquivel (Mashbone & Grifty), Jaime Crespo (Tortilla), Fernando de Peña and Rodrigo Vargas (Elisa y los Mutantes), Elvira Carizzal-Dukes and Ronnie Dukes (A.W.O.L. ), Kat Fajardo (La Raza Anthology and Bandida Comics), Eric J. García (Drawing on Anger), Dustin García (Dustooned Inc.), Ricardo Padilla (co-founder of Latino Comics Expo), Javier Hernandez (El Muerto and writer of the Afterword to my book), Crystal Gonzalez (In the Dark), and Alberto Ledesma (Diary of a Reluctant Dreamer). This is not to mention the many Latinx creators such as Breena Nuñez, Candy Briones, Dave Ortega, Rafael Rosado, Juan Argil, John Gonzalez, José Alaniz, Vicko Alvarez, Mark Martinez, Rafael Rosado, Victor Ávilla, Fernando Rodriguez, José Cabrera, Mark Campos, Cristy Road, Sebastian Kadlecik, MÖM, Alberto Morales, Mike Centino, Jaime Cortez, Federico Cuatlacuatl, Richard Dominguez, Chris Escobar, Eric Esquivel, Kelly Fernandez, Jandro Gamboa, Jenny Gonzalez-Blitz, Raúl González, Roberta Gregory, Israel Francisco Haros Lopez, Adam Hernandez, Celina Hernandez, Los Bros Hernandez, David Herrera, LeighAnna Hidalgo, Marian Julia, Alejandro Juvera, Jeremiah Lambert, Mayra Lara, John Jota Leaños, Liz Mayorga, Rafael Navarro, William Nericcio, David Olivarez, Daniel Parada, Zeke Peña, Carlos “Loso” Pérez, John Picacio, Lila Quintero Weaver, Theresa Rojas, Jules Rivera, Grasiela Rodriguez, Héctor Rodríguez, Stephanie Rodriguez, Miguel Angel “Miky” Ruiz, Carlos Saldaña, Serenity Serseción, Ilan Stavans, Santiago Cohen, Samuel Teer, Ivan Velez, Andrés Vera Martínez, Stephanie Villarreal Murray, Roberto Weil, and Ray Zepeda, Terry Blas, Jordan Clark, Eliana Falcón, Joamette Gil, among many others. With this flourishing of Latinx comics talent, you can see why I remain an optimist, Chris. CH: In your book, you talk about how we are co-creators by bringing the stories alive in our minds as well as imagining our own adventures as that character. Anybody can be a “super” man or woman. What are the benefits then of readers, especially younger readers, having stories that already represent them better than what usually appears in the mainstream? CH: What do you think is needed to really take Latinx representation in comic books today to the next level? Or do you think it already has a good start? FLA: It’s happening as we talk, Chris. In mainstream in-print comics, it’s moving inch by inch in fits and starts. It’s definitely not happening in the silver-screen recreations of the Marvel and DC universes. But it’s really blowing up with Latinx creators. All those that I mention and many others not mentioned are taking comics to the next level — and Latinxs with them. And, we’re seeing lots of collaborations between Latinx and African American creators. I think not only of the work done at SÕLCON: The Brown and Black Comics Expo, but also the collaborations in my edited volume, Tales from la Vida and also Latinx Superheroes in Mainstream Comics. In the latter, John Jennings (known for Kindred, I Am Alfonso Jones, Black Kirby, among others) did the cover art—a Blatinx Queer superhero—and wrote the Foreword. This is where the energy’s at. This is the future of kinetic Latinx storytelling that powerfully geometrizes all of our subjectivities and experiences. CH: If Latinxs make up a greater percentage in the America’s than African American why do you think we have seen characters like Black Panther become so popular or Sam Wilson become Captain America before a Latinx character has? FLA: We can and will have our Wakanda, Chris. Imagine if Marvel Studios got behind White Tiger? Wow! They’re already seeing how an actor like Michael Peña’s a show-stealer. 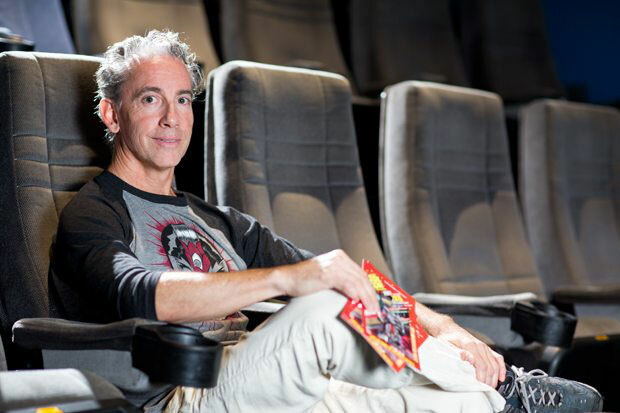 Who do filmgoers remember and talk about after seeing the Peyton’s Ant-Man series of films? Peña! Demographics matter, but they aren’t the panacea. We need a shift in the paradigm where brown matters. And, with capitalism as the current socioeconomic system, this means that producers need to see that there’s a dollar return. There is, of course. We know well that Latinx filmgoers are the majority of folks buying tickets. When we go to the movies, we take the whole familia and everyone else on the block. But until those guys looking to turn big dollar profits stop thinking in black and white, and begin to see brown — and when we start to proactively recruit Latinxs into the behind camera shaping of silver-screen stories, as we saw with Coco — it’ll be awhile till we get our Wakanda. CH: As your book makes abundantly clear there have been and are currently a lot of Latinx in comics. In looking for Latinx creators and characters to write about for this column I have had to spend literally hours on the internet searching. I think this says a lot about why Latinx presence in comics is minimal right now. If it’s hard to find them when you are looking for them how much harder is it for them to be discovered by consumers that aren’t actively searching them out. Why do you think it is so hard to find Latinx in comics? FLA: Latinx creators are constantly working to make visible this powerful visual-verbal storytelling space. Kat Fajardo launched the Latinxs in Comics FB platform. Javier Hernandez and Ricardo Padilla co-founded the extremely successful and ever-growing Latino Comics Expo. My curated site, The Planetary Republic of Comics tries to remedy this. And, the work of my PhD students builds on and complicates the work of Enrique García (The Brothers Hernandez), Jorge Santos (Graphic Memories of the Civil Rights Movement), along with some of my books Your Brain on Latino Comics, Multicultural Comics, Latinx Comic Book Storytelling, the co-edited Graphic Borders, and, of course, Latinx Superheroes in Mainstream Comics. It’s about changing the paradigm — and this takes a huge amount of collective work and time, Chris. CH: Is the decline in printed comic books sales going to negatively affect Latinx representation and growth in comic books or could it somehow work in our favor? FLA: We need to get Latinx comic book storytelling into our classrooms and libraries. That’s why I launched Latinographix, a trade press series that publishes Latinx graphic fiction and nonfiction. We’ve already seen huge successes with the series with Alberto Ledesma’s Diary of a Reluctant Dreamer going into multiple print runs along with Ilan Stavans and Santiago Cohen’s Angelitos, along with my forthcoming edited Tales from la Vida and Drawing on Anger by Eric J. García. These are being adopted for college classroom use as well as populating library bookshelves across the country. CH: You have written numerous books on comic books and culture have you ever considered writing a comic book yourself? What kind of title would you write if you did? FLA: After I co-created with John Jennings a two-page comic “It Could’ve Been. . .” (in Tales from la Vida) I began to work closely with Chilean comics creators Rodrigo Vargas and Fernando de Peña (Mapache Studios) on the sci-fi graphic novel, 2041—sections of which have been published in the Santa Clara Review and the Pacific Review. We will have an ashcan ready for SÕLCON 2018. And the graphic novel will be ready to go into production March 2019 and will be published in my Latinographix series. I should add that I’m currently working with Jason “Gonzo” Gonzalez on my first children’s book, With Papá. This will be going into production this October. I’m so excited!!!! To learn more about Professor Aldama and his books visit his website Professor Latinx.